My favorite wildflower is in bloom on San Juan Island. 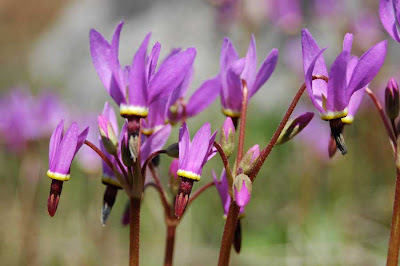 I first discovered this species in my vascular plant diversity class at Reed College, and I first saw it on a field trip in the Columbia River Gorge and learned it was called Poet's Shooting Star. 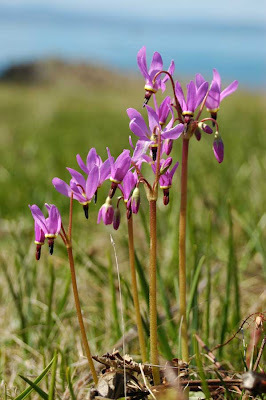 A member of the genus Dodecatheon, it is also known as American Cowslip, Mosquito Bills, Mad Violets, and Sailor Caps. Nice flowers monika, they remind me of our ''Naked ladies' where the flower comes before the leaves. Gorgeous photos and flowers. I want a sweater that color! My TN wildflower book shows our native shooting stars bloom white...sigh. Lovely flowers. I second Vickie's comment about them blooming in white here in the east... These also remind me of Bittersweet Nightshade (from a completely different family, though). Vickie and Heather - Yeah, they wouldn't be nearly the same without that gorgeous color! Happy Easter! Or Should I Say Happy Eostre?